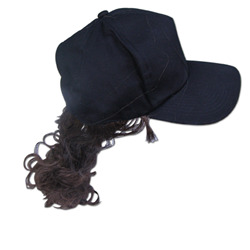 The Billy Ray Hat With Ponytail includes one black baseball style cap with attached brown hair ponytail. Looking for a way to contain that good old business in the front, party in the back? Then slap this cap right on your doggone head! The Billy Ray Hat With Ponytail is the perfect finishing touch for any hillbilly Halloween costume. Wear it with a bandana and a beard, and you can pull off a biker look too!